This tour takes you to the two prime destinations of any Nepal stay. One, the capital city Kathmandu, boasts an amazing scene at every turn and the other, a beautiful lakeside town overlooked by Nepal’s famous snowcapped peaks, lets you experience why Nepal is one of the worlds top destinations. It is possible to extend your trip, ex Kathmandu or Pokhara, to include Chitwan Wildlife Park and/or treks, pilgrimage, or relaxed getaways. 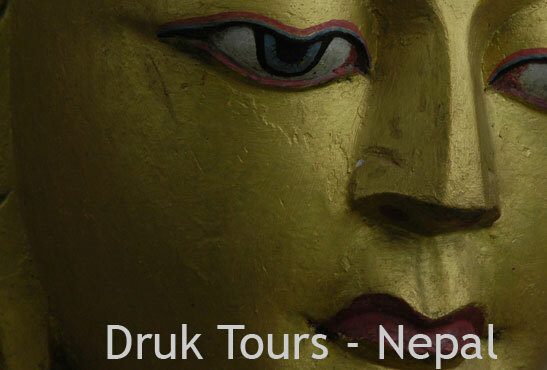 These are described at the end of the detailed Birds Eye Nepal itinerary. You will be met at the airport and then driven through the bustling streets of this town – a blend of ancient and modern. After hotel check in, you can relax and maybe wander through the streets. Begin your journey to Nepal with a birds eye view – an early morning, 45 min breathtaking flight that soars over the valley and takes you see the unmistakable Mt Everest – to the Nepalise she is “Mother of the Universe”, and to us, the world’s highest peak. Back on the ground, you will spend the reminder of the day exploring the streets and sites of Kathmandu. The best place to begin is Durbar Square and the many interesting places clustered around - Hanuman Dhoka, ancient royal palace, Mahadev and Parvati Temples, Kumari Bahal and the House of the Living Goddess. Later you can visit the Buddhist stupa of Swayambuhnath set atop a hill and crowded with monkeys. Then explore the local bazaars. Lets devote this day to exploring art, architecture and history. Drive through the countryside towards the ancient city of Patan, also known as the “City of Grace and Fine Arts”. On the way, you may stop at the Tibetan Refugee Crafts Centre. At Patan, there are many interesting places to visit - a sky-piercing Taleju Temple, a statue of Yogendra Malla, carved balconies of wood, ancient windows, curio shops and bustling bazaars. After lunch we take you to the ancient maedieval capital, Bhaktapur. Its many interesting streets provide you a window into ancient life. You may choose to explore the royal palace, which has a small but excellent west wing museum. See also the Golden Gate, (the Sun Dhoka) which is the entrance to the Palace of 55 Windows, renowned as the most significant piece of artwork in all of Nepal. Later, visit the greatest living example of traditional Nepalese temple architecture, and highest temple in the Kathmandu valley, the Nyatapola Temple. Heading back into Kathmandu you visit one of the most important Buddhist stupas in the world at Boudhnath, and wander the market under the all-seeing eyes of Buddha. Furthering our journey we visit one of the holiest Hindu shrines in the world - Pashupatinath Temple. This temple is dedicated to Lord Shiva and is situated on the bank of the river Bagmati. Its pagoda style temple with gilt roof and richly carved doors is magnificent and a visit here is a must. Today, after having enjoyed several days exploring the rich heritage of Nepal, we head to higher views to be moved by Nepal’s natural wonders. The morning flight quickly lands you in Pokhara, a popular village town where snow-capped mountains reflect in its placid lake. Pokhara is the starting point of some of the most famous treks and day trips in Nepal and boasts some great sites. This day relax by lakeside and explore the sites while drinking in the majestic mountains above you. Rent some bicycles and explore the valley and its three lakes, Rupa Tal, Begnas Tal and the largest and most well known, Phewa Tal. Take an excursion with a picnic lunch to Devi Falls. Spend the afternoon quietly on a boat on the lake, and continue to drink in the view of Mount Annapurna and the Fish Tail Mountain, Macchapuchhare. Fly back to Kathmandu and spend the day exploring the city on your own while you also get in some last minute shopping. In the evening you may wish to enjoy Kathmandu’s varied nightlife. * Should you wish for a relaxed getaway - spend one or more nights at Nagarkot / Dhulikhel on outskirts of Kathmandu. * Should you wish for the ultimate panoramic view - Daman (2,500m), approximately 80 km southwest of the Kathmandu valley is the place to stay. Here you will see the only unimpeded view of the entire Himalayan range - 400kms of Himalayan panorama! Hike in the local hills or a lounge in your hotel surrounds. Rock climbing, cycling, hiking are a few of the many activities possible here. * Should you wish to trek Nepal through its green valleys and small mountain villages – it is possible to extend ones stay in Pokhara to allow for this - we can organize anything from 2-10 day treks where you can explore the natural wonder of Nepal and its local village life. * Should you wish for a wildlife experience to see the Bengal tiger, the one horned rhino or go on an elephant safari – spend two or three more nights (ex Pokhara to Chitwan National Park). * Should you wish a short pilgrimage in the mountains – from Pokhara take a morning helicopter flight (1.5hrs) to Josom (8,300ft) then bathe in a holy bath stone fountains and partake in puja and darshan at the Muktinath temple. Josom is famous for its unique mountain terrain, beauty and climate. It is has a strategic place on the Annapurna trek. Fly back to Pokhara that afternoon. Best months are September, October and November during the Autumn season March, April & May.